We conducted field studies in 2010 to assess the impact of predation by Caspian terns (Hydroprogne caspia), double-crested cormorants (Phalacrocorax auritus), and other piscivorous colonial waterbirds on juvenile salmonids (Oncorhynchus spp.) in the Columbia River basin. Additionally, we monitored the Caspian tern colonies located outside the Basin that were recently established on alternative nesting habitat for Caspian terns displaced from East Sand Island, as part of the Caspian Tern Management Plan. The Caspian tern colony on East Sand Island in the Columbia River estuary, the largest of its kind in the world, consisted of about 8,283 breeding pairs in 2010, significantly less than in 2009 and the smallest the colony has been since it became fully established in 2001. Although the recent decline in size of the East Sand Island tern colony was coincident with a reduction in the amount of nesting habitat made available to terns on East Sand Island, nesting habitat did not appear to limit the size of the East Sand Island tern colony in 2010. Based on nesting densities observed at the East Sand Island tern colony over the past several years, plus poor nesting success during the 2010 El Niño, the reduction in available nesting habitat from five acres in previous years to 3.1 acres in 2010 was not the primary cause for the decline in colony size observed in 2010. Further reductions in the amount of Caspian tern nesting habitat provided on East Sand Island in future years will be necessary to realize the goal of relocating a majority of the East Sand Island tern colony to alternative sites, as prescribed in the Caspian Tern Management Plan. Juvenile salmonids continued to be a large part of the diet of Caspian terns nesting on East Sand Island, comprising 33% of the overall diet in 2010, slightly higher than the 10-year average during 2000-2009 (30%). 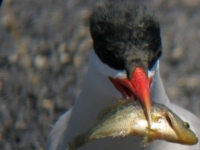 As in previous years, marine forage fishes dominated the diet of Caspian terns nesting on East Sand Island, comprising 62% of all identified bill loads in 2010. Caspian terns nesting at the East Sand Island colony consumed about 5.3 million juvenile salmonids (95% c.i. = 4.5 – 6.1 million) in 2010, not significantly different than the smolt consumption estimates from the previous two years. Since 2000, the average number of smolts consumed by Caspian terns nesting on East Sand Island was 5.3 million smolts per year, less than half the annual consumption of juvenile salmonids by Caspian terns in the Columbia River estuary prior to 2000, when the breeding colony was located on Rice Island. Further reductions in smolt consumption by terns nesting on East Sand Island will require a significant reduction in the size of the tern colony; future management plans are designed to reduce the size of the East Sand Island tern colony to about one-third its pre-management size. Implementation of the federal management agencies’ Caspian Tern Management Plan for the Columbia River Estuary continued outside the Columbia River basin, with the USACE-Portland District and its state and federal partners building four new Caspian tern nesting islands prior to the 2010 nesting season. Two of the islands are located in Lower Klamath National Wildlife Refuge, California (a 1-acre silt-core island in the Orems Unit and a 0.8-acre floating island on Sheepy Lake); one island is located in Tule Lake National Wildlife Refuge, California (a 2-acre rock-core island in Sump 1B); and one island is located at Summer Lake Wildlife Area, Oregon (a 0.5-acre rock-core island in Gold Dike impoundment). The severe drought in the Upper Klamath Basin and adjacent areas of interior Oregon, however, precluded allocating water to three of the four impoundments where new islands were built. Nevertheless, Caspian terns quickly colonized the new 0.8-acre floating island at Sheepy Lake in Lower Klamath National Wildlife Refuge, where 258 pairs raised 168 young. Nineteen terns that had been banded in the Columbia River estuary were re-sighted at the Sheepy Lake tern island. We continued to monitor four other alternative colony sites constructed by the USACE-Portland District in interior Oregon during 2008 and 2009: Fern Ridge Reservoir tern island; Crump Lake tern island; and East Link and Dutchy Lake tern islands in Summer Lake Wildlife Area. No Caspian terns successfully nested at three of these four islands and the fourth experienced very low nesting success, apparently due to adverse weather conditions and low forage fish availability associated with El Niño conditions during the 2010 nesting season. 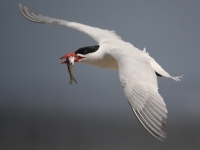 Diet composition and PIT tag recovery data from Caspian tern colonies in interior Oregon and northeastern California indicated these colonies were primarily consuming cyprinids (i.e., tui chub Gila bicolor), centrarchids (i.e., crappie Pomoxis spp. ), and ictalurids (i.e., brown bullhead Ameiurus nebulosus) in 2010. Catostomids (suckers), several species of which are listed under the Endangered Species Act, were not identified in the diet of terns nesting at Crump Lake in 2010. One juvenile sucker (species unknown) was observed at the Summer Lake Caspian tern colony and four juvenile suckers (species unknown) were observed at the Sheepy Lake Caspian tern colony in 2010. Suckers represented a very small percentage (< 0.1%) of identifiable prey items at these two tern colonies. No sucker PIT tags were recovered from Caspian tern colonies in either interior Oregon or northeastern California in 2010. East Sand Island is also home to the largest double-crested cormorant colony in western North America, consisting of about 13,596 breeding pairs in 2010; 2010 was the second consecutive year where the colony grew by more than 10%. Juvenile salmonids represented about 16.4% of the diet of double-crested cormorants nesting on East Sand Island in 2010, compared with 9.2% in 2009. Double-crested cormorants nesting at this colony consumed approximately 19.2 million juvenile salmonids (95% c.i. = 14.6 – 23.8 million) in 2010, the highest annual smolt consumption ever estimated for the East Sand Island cormorant colony. In the past two years, smolt consumption by double-crested cormorants nesting on East Sand Island was significantly greater than smolt consumption by Caspian terns nesting on East Sand Island. 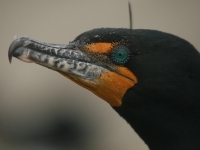 Management options to reduce or limit smolt losses to the double-crested cormorant colony on East Sand Island are under consideration by federal, state, and tribal resource management agencies. In order to reduce predation on juvenile salmonids by double-crested cormorants in the Columbia River estuary, it will be necessary to reduce the size of the cormorant colony on East Sand Island. Non-lethal management approaches, such as relocating a portion of the colony to alternative colony sites along the Pacific coast, seem more appropriate in the context of the cormorant colony on East Sand Island, whose initial growth appears to have occurred largely at the expense of other colonies in the region. As was the case with Caspian tern management in the Columbia River estuary, any management of double-crested cormorants to reduce smolt losses in the estuary will require analysis under the National Environmental Policy Act (NEPA), a process that is currently underway. Further up-river in the Columbia Plateau region, Caspian terns and double-crested cormorants are also the two bird species responsible for most of the smolt losses to avian predators. Management options to reduce the impacts of these two avian predators on smolt survival along the mid-Columbia and lower Snake rivers are currently being considered by resource managers. In 2010, the largest breeding colonies of Caspian terns in the Columbia Plateau region were on Crescent Island (in McNary Pool) and on Goose Island (Potholes Reservoir, WA), where 375 pairs and 416 pairs nested, respectively. Caspian tern nesting success at the Crescent Island colony averaged 0.52 young raised per nesting pair, higher than in recent years, while the Goose Island tern colony experienced almost complete nesting failure in 2010. Three other smaller Caspian tern colonies in the Columbia Plateau region also failed or nearly failed to produce any young. In 2010, salmonid smolts represented 71% of tern prey items at the Crescent Island colony and 21% of tern prey items at the Goose Island colony; estimated smolt consumption by terns nesting at these two colonies was 420,000 smolts and 122,000 smolts, respectively. The largest colony of double-crested cormorants on the mid-Columbia River was on Foundation Island (in McNary Pool), where 308 pairs nested in 2010. Diet sampling during 2005-2010 indicated that ca. 50% (by mass) of the Foundation Island cormorant diet was juvenile salmonids during May (the peak of smolt out-migration), while less than 10% of the diet was salmonids during early April, June, and July. A total of 36,764 PIT tags from 2010 migration year smolts were recovered on bird colonies in the Columbia Plateau region. PIT tag recoveries indicated that smolt losses in 2010 were similar for Foundation Island cormorants (8,481 tags) and Crescent Island terns (8,255 tags). Substantial numbers of smolt PIT tags were also detected on the Caspian tern colony on Goose Island in Potholes Reservoir (8,512 tags) and on a mixed California gull (Larus californicus) and ring-billed gull (L. delawarensis) colony on Miller Rocks in The Dalles Pool (5,045 tags). PIT tags recovered from the Caspian tern colony in Potholes Reservoir were almost exclusively from upper Columbia River salmonid ESUs, while PIT tags recovered on other bird colonies in the Plateau region consisted of smolts from upper Columbia, Snake, and middle Columbia ESUs. Preliminary results indicate that Caspian terns from the Goose Island colony in Potholes Reservoir consumed an estimated 9.6% of the juvenile steelhead (Oncorhynchus mykiss) PIT-tagged and released at Rock Island Dam on the upper Columbia River in 2010. Predation rates by Crescent Island terns on Snake River steelhead (ca. 2.8%) and by Foundation Island cormorants on Snake River steelhead (ca. 1.3%) and Snake River sockeye (ca. 1.7%) were also notable in 2010, although lower compared to previous years (2004-2009). California and ring-billed gulls have nested in large numbers on islands on or near the mid- and upper Columbia River, but these gulls have generally consumed few fish and even fewer juvenile salmonids, with the exception of the gull colony on Miller Rocks in The Dalles Pool (see above). 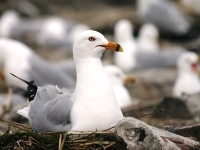 In 2010, the number of gulls counted on the Miller Rocks colony was 5,533, down from 6,016 gulls counted on colony during the 2009 breeding season. Despite this decline in the number of gulls counted on the Miller Rocks gull colony, the number of gulls utilizing Miller Rocks during the breeding season has increased by about 150% since 1998. Similarly, the American white pelican (Pelecanus erythrorhynchos) colony on Badger Island in McNary Pool has experienced significant growth since the late 1990’s, increasing from 100 adults on colony in 1999 to 1,643 adults in 2010. Unlike the Miller Rocks gull colony, however, pelicans nesting at Badger Island are not consuming large numbers of juvenile salmonids, based on the relatively small numbers of smolt PIT tags detected on the colony. Continued monitoring of these and perhaps other incipient piscivorous waterbird colonies in the Columbia River basin will be necessary to determine the magnitude and trend for total losses of juvenile salmonids to avian predators in the basin.